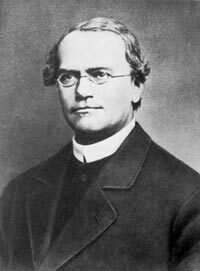 Born on July 22, 1822, Johann Gregor Mendel was a Moravian scientist by occupation. He was the son of a peasant and the grandson of a gardener who was initially taught be a local priest before being admitted into an institute of philosophy. Due to financial shortcomings, however, he was forced to terminate his studies in 1843 and go back to a monastery in Brunn. Mendel felt that the monastery was the ideal place to pursue his studies without being troubled by lack of finances. While at the monastery, he gave himself the name Gregor and was placed in charge of the garden. He joined the priesthood in 1847. Four years later, he enrolled at the University of Vienna where he studied physics, botany, and chemistry. After the completion of his studies, he went back to the monastery to teach natural sciences. Mendel used his free time to conduct his hereditary experiments. By statistically analyzing the experiments of breeding, he had ventured into a unique area of study. His studies coupled with his vast knowledge of natural sciences were what guided him through the experiments. He mostly opted to use pure variety pea plants that had been cultivated in a controlled atmosphere. Mendel crossbred several seeds and then collected the results based on the seven most obvious variations and seeds. Mendel came to the conclusion that tall plants created both long and short offspring while short plants only created short offspring. After discovering that only a third of the long plants created long offspring, he inferred that there were two types of long plants – one that did not breed true plants and the other that bred true plants. Even after making these conclusions, he still proceeded with the experiments. He hoped to find more information regarding the offspring by crossbreeding different sized plants. He was under the assumption that crossing a short plant with a long one would result in a medium sized plant, but he would later discover that this was not the case. He continued crossing different plants and calculating the results. Mendel planted some pea plants that had a cross of short and long genes and some with only long genes. He then pollinated some of the plants himself. All the naturally pollinated plants from the cross of long-short plants grew long while one of long plants that were unnaturally pollinated grew short. He deduced that the tallness of the plant was its dominant trait while that of shortness was a recessive trait. These results were not dependent on whether the plant was female or male. Mendel came to this conclusion after roughly eight years and he included over 30,000 pea plants in his investigation. The first heredity law, which is the law of segregation, is entirely based on Mendel’s observations regarding the breeding of plants. It states that genes (units of heredity) are in pairs and the paired gene becomes divided when the cell is divided. Each paired gene is present in both halves of the egg or sperm. In January of 1884, Mendel died at the age of 61. According to sources, he had Bright’s Disease, which was a name given to a variety of kidney problems.